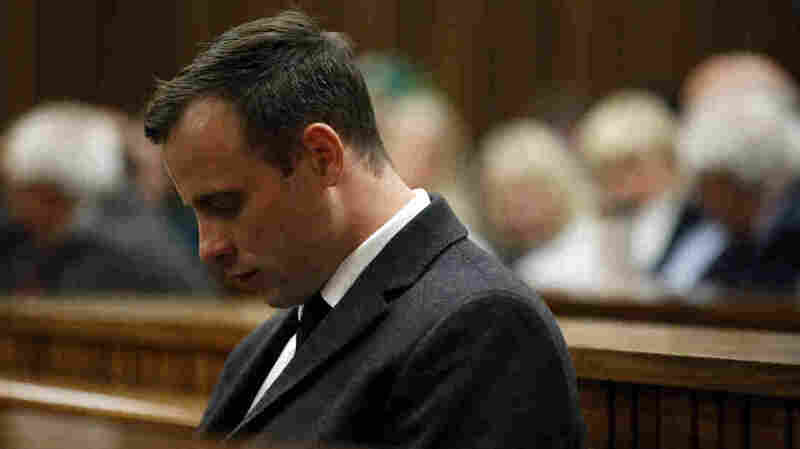 Oscar Pistorius' Prison Sentence More Than Doubled : The Two-Way South Africa's Supreme Court said it was sentencing the former Olympian to 15 years, minus time served, for the 2013 murder of his girlfriend. Prosecutors said his original sentence was too lenient. Former Olympic athlete Oscar Pistorius appeared at his trial in July 2016. On Friday, his sentence was more than doubled. Justice Willie Seriti of South Africa's Supreme Court of Appeal announced Friday that the five-judge panel had upheld prosecutors' appeals, according to The Associated Press, and increased the sentence to 15 years, minus time served. Fifteen years is the country's usual minimum sentence for murder. Steenkamp's family applauded the increased sentence. "This is an emotional thing for them. They just feel that their trust in the justice system has been confirmed this morning," family spokesperson Tania Koen told Reuters. Pistorius shot Steenkamp four times through a door on Valentine's Day in 2013, but he argued that he had thought she was an intruder in his house. Then in July of last year, he was sentenced to six years in prison. As NPR's Bill Chappell wrote at the time, "Judge Thokozile Masipa cited 'substantial' mitigating factors in the case of the double-amputee athlete, saying that a long jail term 'would not serve justice.' "
The ruling is likely the end of Pistorius' legal options. "Pistorius' lawyers have just one avenue open to them if they want to challenge the new sentence handed down by the Supreme Court, and that is to appeal to the Constitutional Court, the highest court in South Africa," the AP says. "Pistorius failed with an appeal to the Constitutional Court last year to challenge his murder conviction."